HarePoint Thumbnails for SharePoint 1.0 無料ダウンロード - Preview document and image thumbnails directly in SharePoint document libraries. HarePoint Thumbnails for SharePoint allows you to display document and image thumbnails directly in SharePoint document or picture libraries. 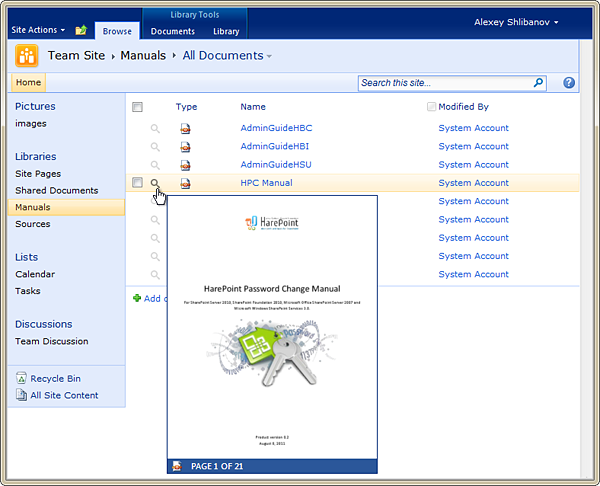 It provides the very convenient opportunity to preview documents instead of downloading and opening it. - E-mail messages (eml, msg). Among the important product features are: adjustable settings for thumbnail appearance and compatibility with SharePoint 2010 and 2013. HarePoint Thumbnails for SharePoint will be a lifesaver when you are trying to locate a specific document, image or presentation in a large document or image library! Search messages and other items in mailboxes on Microsoft Exchange servers.